For the majority of bacterial fish pathogens, chronic stress is considered a key factor in disease outbreaks as is the case for Flavobacterium columnare (F. columnare), the causative agent of columnaris disease [6, 7]. This disease can give rise to multiple clinical signs, such as skin lesions, mouth rot, and gill lesions  and causes huge financial losses in carp, catfish and trout aquaculture [6, 8–10]. A consistent finding throughout the challenges performed by Declercq et al. [11, 12] was the marked individual variation in susceptibility to columnaris disease, especially for the fish exposed to the low virulent isolate. Clinically healthy fish were co-present with moribund animals displaying severe gill pathology following inoculation with a low virulent F. columnare isolate. Currently, a thorough explanation for these results is being debated. Individual coping styles of fish have been attributed to varying cortisol levels in fish following an acute stress stimulus [13, 14]. In the aforementioned immersion challenges to reproduce columnaris disease, netting the fish and placing them in the inoculation bath for 90 min were shown to be stress stimuli. The challenge procedure itself may have resulted in fish displaying varying plasma and mucus cortisol levels engendering different degrees of susceptibility towards the different F. columnare isolates with which the fish were exposed. To validate this line of reasoning, one may propose there is a direct effect of cortisol on the F. columnare bacterial cells. Indeed, a recent study from our lab revealed a dose-dependent impact of cortisol on the colony morphology of F. columnare . The higher the cortisol concentration in the bacterial cultures, the less rhizoid the resulting colonies were . Gliding is a well-described trait for F. columnare cells [6, 16, 17] and is reflected in the rhizoid shape of colonies, a feature positively linked to virulence . The type IX secretion system (T9SS) is required for gliding motility as it is involved in the secretion of cell surface proteins of the gliding apparatus [19–22]. Genetic analyses suggest that GldK, GldL, GldM, GldN, SprA, SprE, SprT, and PorV are T9SS components [21, 22]. This system is needed for the secretion of SprB and RemA, mobile surface adhesins involved in gliding and movement over surfaces. Cells with mutations in the genes encoding these adhesins were affected in gliding  and failed to attach to glass . 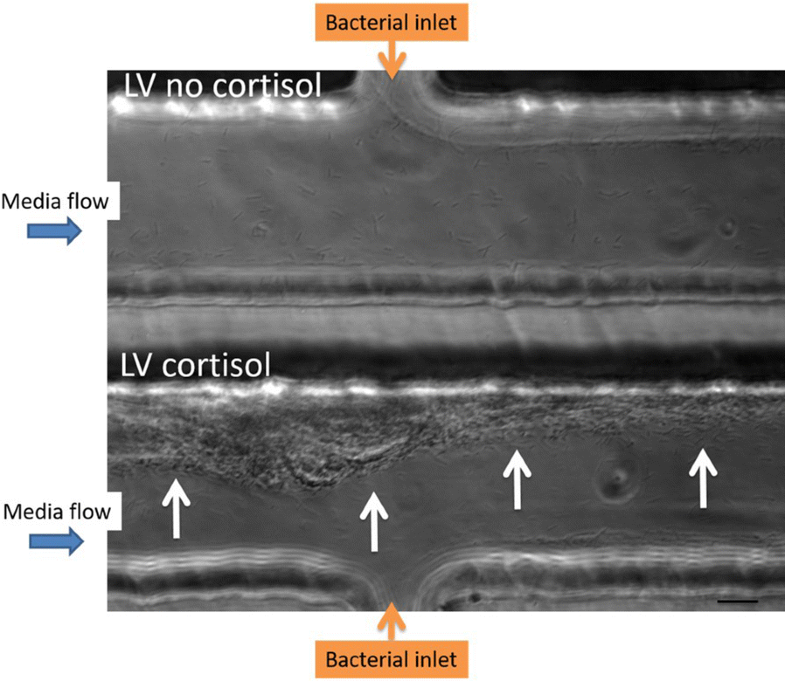 The formation of biofilms on gill filaments is an important step in establishing gill pathology in columnaris disease as observed during in vivo trials . Biofilm formation is a multistage process that is initiated through different stimuli with free-living or planktonic bacterial cells gliding over a surface prior to attachment [24–26]. The cells lose their motility and cluster together  and are then referred to as sessile or biofilm cells. 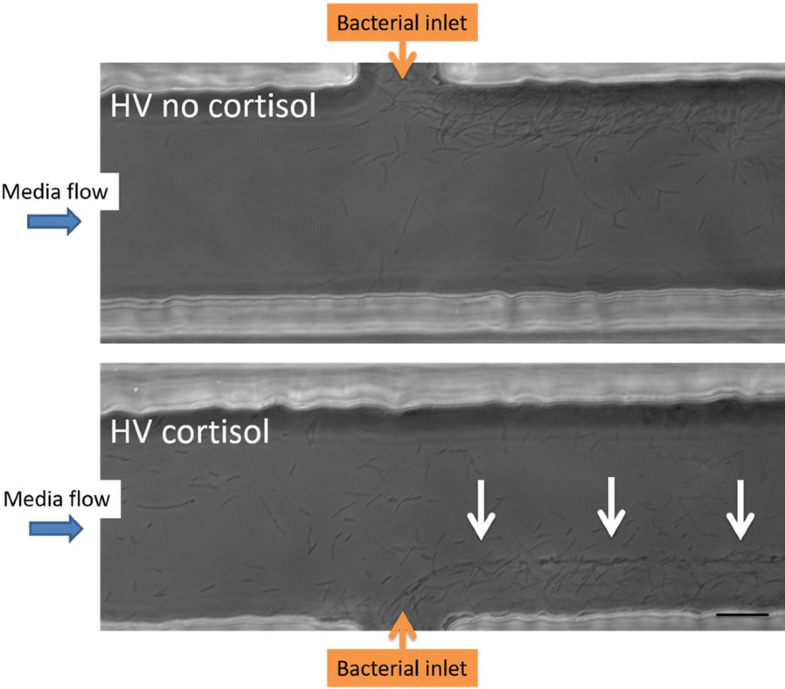 Bearing in mind the above cited effects of cortisol on the rhizoid shape of the bacterial colonies and their gliding motility, one might expect that the presence of cortisol may impact the capacity to form biofilms. 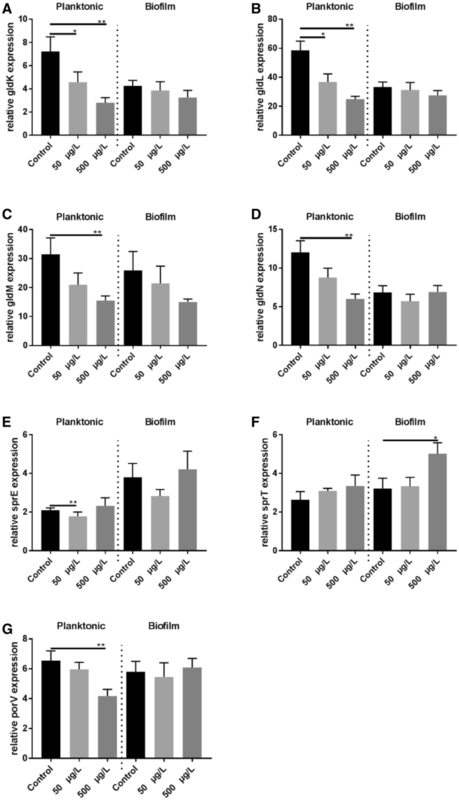 Likewise, differential expression of gliding motility genes may be presumed in biofilm-forming cells versus their free-swimming counterparts following incubation in the presence and/or absence of cortisol. 13567_2019_641_MOESM1_ESM.wmv Additional file 1. Movie of a microfluidic chamber experiment. 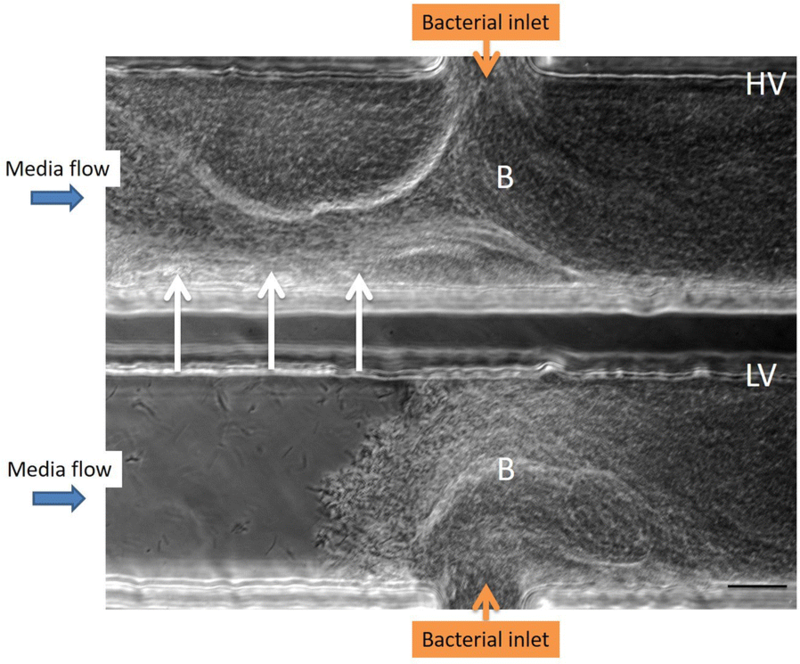 The upper chamber shows the highly virulent F. columnare cell aggregates resembling biofilm filling the entire channel within 7 h pi, starting at the bacterial inlet and building up to the middle of the channel to eventually reach the opposite side of the channel. The cell aggregates are thick, dense structures, representative of a dense biofilm. The lower chamber shows the build-up of cell aggregates of the low virulent F. columnare isolate. 13567_2019_641_MOESM2_ESM.pdf Additional file 2. Mean relative gene expression results ± SEM. Differential gene gldK (A), gldL (B), gldM (C), gldN (D), porV (E), sprA (F), sprE (G), sprT (H) expression in planktonic and biofilm cells of highly (HV, isolate 090) virulent F. columnare isolates following supplementation with a low (50 µg/L) or high (500 µg/L) cortisol dose. (I) represents the differential sprA expression of the low (LV, isolate CDI-A) virulent F. columnare isolate. No statistically significant differences were found in the results presented in this graph. The error bars indicate the standard error means.